These bright pink and tangy fruits bring me back to my childhood summers. Back when I was a mini-me, we had raspberry bushes in the fields near our house. With my heart filled with courage, I would fearlessly fetch these fruits, though the thorns of the bush’s stalks left me prickled and scratched. I would first reach for the low-hanging fruit, but the tempting fruits were beyond arm’s reach and required me to wade deeper into this “ouchy” plant. Of course, it was worth it every time. Basically, raspberries bring me to my happy place. Raspberries also bring me to my healthy place. They are a good source of manganese (important for bone health and metabolism), vitamin C (helps limit the aging of skin) and fiber (you know what that does 😉 ), which are 3 nutrients worth befriending. Also, raspberries contain ellagic acid, a natural phenol which acts as a powerful antioxidant by helping prevent unwanted damage to your body’s cells. This here recipe is one with minimal ingredients. As you will see when you make it (wink, wink, nudge, nudge), it is very quick and easy to make. Your taste buds shall go wild! Mix all ingredients for the crust in a food processor and blend well. Pat down into a 8 or 9- inch cake dish. Place crust mixture in the freezer and allow to set as you prepare the mix for the filling. In the food processor, combine all ingredients for the filling and pulse until a smooth homogeneous bright pink mix is obtained. Add on top of the crust and place back in the freezer for 1.5 hours. 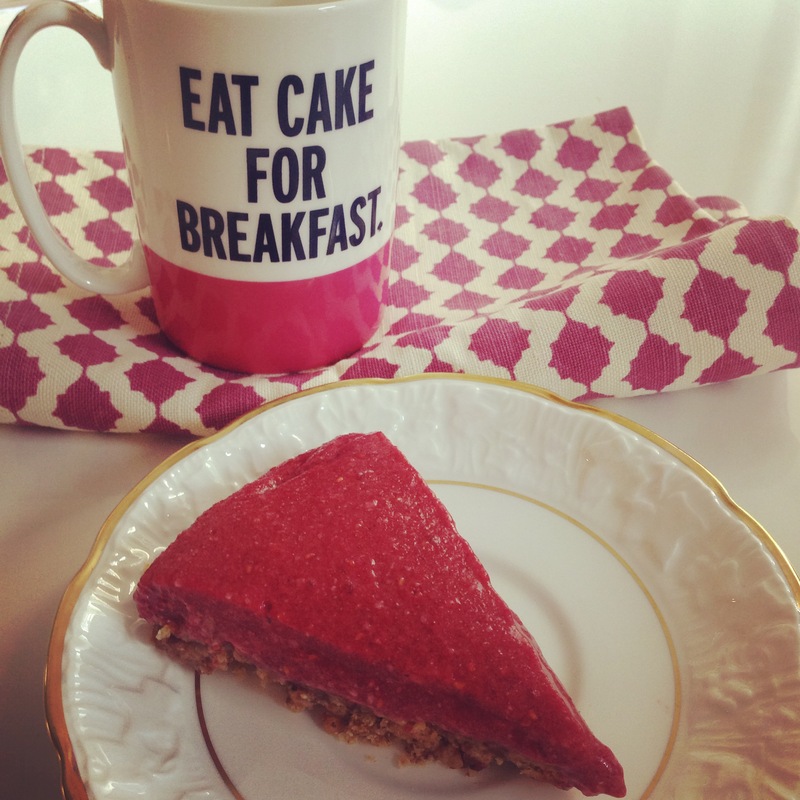 Oh, and you literally could eat this cake as part of your breakfast. No problemo!